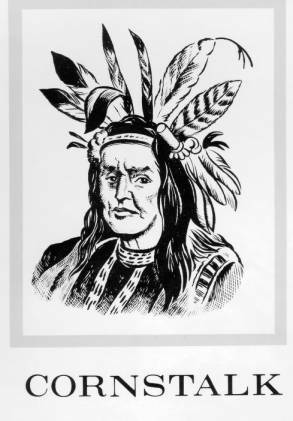 Cornstalk, Chief of the Shawnee tribe, led his people in a battle against the British at what is now Point Pleasant, West Virginia. They were defeated and Cornstalk signed a treaty with Lord Dunmore in 1774. Lord Dunmore's War was a confrontation between Virginia and the American Indians of the Ohio Country in 1774. In 1768, the Iroquois and the British signed the Treaty of Fort Stanwix. In this agreement, the Iroquois gave all of their lands east and south of the Ohio River to the British. While the Iroquois agreed to give up this land, most Ohio American Indians did not, including the Delaware, the Seneca-Cayuga, and the Shawnee. White settlers immediately moved into the region. By the spring of 1774, violent encounters had taken place in the disputed area as the American Indians, especially the Shawnee, tried to drive the British colonists back to the eastern side of the Appalachian Mountains. On May 3, 1774, a group of British colonists, seeking vengeance, killed eleven Seneca-Cayuga. At least two of them were relatives of Chief Logan, leader of the Seneca-Cayuga at Yellow Creek (near modern-day Steubenville). Upon hearing of the murders, many Seneca-Cayuga and Shawnees demanded retribution. Some, like the Shawnee leader Cornstalk, urged conciliation. Cornstalk and most other Shawnee promised to protect British fur traders in the Ohio Country from retaliatory attacks since the traders were innocent in this attack. Logan, however, was not kept from his vengeance, Shawnee and Seneca-Cayuga leaders did not stop him from attacking British colonists living south and east of the Ohio River. Logan took approximately two dozen warriors to seek revenge on the colonists in western Pennsylvania. There his followers killed thirteen settlers before returning back west of the Ohio River. Captain John Connolly, commander of Fort Pitt, immediately prepared to attack the Ohio Country American Indians. John Murray, Lord Dunmore, the royal governor of Virginia, offered his colony's assistance. Dunmore hoped to prevent Pennsylvania's expansion into modern-day West Virginia and Kentucky. He wished to place Virginia militiamen in these regions. He also hoped to open these lands to white settlement. In August 1774, Pennsylvania militia entered the Ohio Country and quickly destroyed seven Seneca-Cayuga villages, which the Seneca-Cayuga had abandoned as the soldiers approached. At the same time, Lord Dunmore sent one thousand men to the Kanawha River in modern-day West Virginia to build a fort and to attack the Shawnee. Cornstalk, who had experienced a change of heart toward the white colonists as the soldiers invaded the Ohio Country, sent nearly one thousand warriors to drive Dunmore's force from the region. The forces met on October 10, 1774, at what became known as the Battle of Point Pleasant. After several hours of intense fighting, the British drove Cornstalk's followers north of the Ohio River. Dunmore, with a large force of his own, quickly followed the Shawnee across the river into the Ohio Country. Upon nearing the Shawnee villages on the Pickaway Plains north of modern-day Chillicothe, Ohio, and near what is now Circleville, Ohio, Dunmore stopped. From his encampment named Camp Charlotte, Dunmore requested that the Shawnee come to him and discuss a peace treaty. The Shawnee agreed, but while negotiations were under way, Colonel Andrew Lewis and a detachment of Virginia militia that Dunmore had left behind at Point Pleasant crossed the Ohio River and destroyed several Shawnee villages. Fearing that Dunmore intended to destroy them, the Shawnees immediately agreed to terms before more blood was shed. As a result of this war, some Shawnee natives agreed to the terms of the Treaty of Fort Stanwix (1784), and promised to give up some of their lands east and south of the Ohio River. This was the first time that some of the American Indians who actually lived in the Ohio Country agreed to relinquish some of their land. In addition, these Shawnee also promised to return their white captives and to no longer attack British colonists traveling down the Ohio River. However, not all Shawnee and affiliates -- including other related American Indian nations in the Ohio territory -- were signatories to the treaty.